This mini-series sketches out some of the ideas that I would like to explore at the upcomingTDSIG Unplugged Conference in Barcelona on 21 May 2011. If any of them chime with you and you would like to explore them as well – or if you would like to work on completely different issues, the conference is there to give you the open space to do just that. It is never too late to join in, so if you haven’t already, visit www.tdsig.org/unplugged and register! What is our dream for Dogme & EdTech? As long as I can remember, teaching unplugged has stood in opposition to technology in the classroom. Or rather, this is how the situation has been portrayed by some. The common conception (or misconception) is that unplugged teaching requires eschewing all forms of convenience, such as coursebooks, broadband internet access, mobile devices, Web 2.0 tools etc. As if unplugged teachers were seeking total self-sufficiency – drop a teacher raised on EdTech into a zero-resources area, goes the myth, and they would be eaten for breakfast; drop an unplugged teacher into a zero-resources area and, like Rambo, they would thrive. Still, I have a dream. I have a dream that, one day, all developing unplugged teachers and all developing EdTech teachers will be able to play together in the staffroom, exchanging ideas in a positive and appreciative way. I have a dream that conference coffee breaks will be filled with conversations from tables surrounded by unplugged teachers and EdTech teachers, rather than separated by seas of carpet and ignorance. I have a dream that those reports will present hard data about the positive impact of both approaches to teaching – and show how these strengths can best be blended. I have a dream that labels like “faff” and “cave-dweller” fall from memory as easily as they once fell from the tongue or the keyboard. I have a dream that labels like “unplugged” or “EdTech” will no longer be necessary, as we walk together towards pedagogic righteousness. Whether it be to do with dogme and EdTech or not: what is your dream for tomorrow? Let’s share it on Saturday. Cracking! You are in the zone, Anthony – wish I wasn’t so mired in admin and “restructuring”. I need time to think and dwell on these things. for the moment, thank you for distilling and verbalising the good bits! Wanna be in Barcelona – really really do…. Thanks, Candy – I feel mired in my appallingly untidy desk at the moment! Yay, I’m not the only one! Sometimes it feels as if I am swimming in a sea of paper. Somehow I think a dogme approach to admin wouldn’t be totally welcome, though! Agree with Candy that this series is great, and it’s nice to get your thoughts on the questions about teaching unplugged (and related issues, like here). Also really really wanna be in Barcelona! I’m definitely drowning in paper at the moment, so you’re not alone, Mike! To be honest, I don’t understand the edtech vs dogma debate – you’re probably right, Anthony, that it’s probably just a misconception. I think they’re perfectly compatible. I’m for dogme, and I’m for edtech – so, what does that make me? A DogME to cLiMB? Hey Anthony, How did you make that video! It’s great. I’d love to do one to the theme of Hawaii 5 O – my mind works with images to music!! I spent 3 hours yesterday clearing the literal paper mountain in my home office. Threw out bags and bags – feel much lighter now. Nice dream though – although when it comes to on-line initial teacher training courses it’s more of an “Alptraum” as they say in German! I have to say I am baffled by the debate about technology in ELT. Isn’t it just a case of using it if you and the students find it useful and if not, not. Is it necessary to take a stance? Seriously, I actually do think taking a principled decision on things and asking others to do the same is central to the notion of professionalism, and I think we should be open to making explicit our reasons for thinking whether a given aspect of our practice is “useful” or not. Further, we should be willing to acknowledge when we are acting on pedagogic instinct rather than fact (which is to say, much of the time!) and accept it when teachers of a different stripe do the same. The reason why this “argument” keeps flaring up, it seems to me, is that those engaged in it (myself included! ), from time to time, lose sight of this basic rule of the game! “Angles” – you are right, that’s the word I should be using. I also don’t find “tech” to contradict unplugged – at least from where I stand there seems to be room for them both to coexist. Wish I could come to Barcelona! Thanks for stopping by, Naomi, and I’m glad you found the idea of “angles” useful (I wasn’T sure it would make much sense to anyone but me, so it’s reassuring to hear from you!). Your context sounds fascinating – I’ll have to check out your blog to see more. I wish I knew about SEN-related applications of Dogme – anyone reading this able to help? Hi Anthony, and thanks for this and the other posts you’ve written in the run-up to the Unplugged conference. I saw you around at IATEFL recently, but circumstances meant I didn’t get to introduce myself – will remedy this on Saturday. I’m really looking forward to being at the conference. 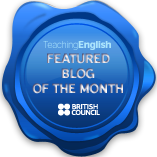 Dogme ELT/Teaching Unplugged is something I am very keen on and interested in – I’m also a teacher who is enthusiastic about technology and the possibilities it offers for language teaching and learning, so I’m with Duncan here. In ELT, as in music, I think there’s a pressure to categorise and label which can do a lot of damage and misrepresents a lot of what actually goes on in many teachers’ classrooms. I’m a case in point – although I’m definitely labelled as a ‘tech teacher’, some of the most rewarding classroom experiences I’ve ever had have come out of the conversations I’ve had with learners that were unplanned and that emerged from us being together in the room – let’s say, what is the essence of Dogme ELT. Where I differ from some other ‘Unplugged’ teachers (but not all, thankfully), I guess is that I am happy to turn to the Internet and technology when I think it will enhance the learning experience. I do think that the way forward here is for greater dialogue and understanding between teachers who are interested in different aspects of teaching. In particular, teachers who are passionate about using technology also need to be reminded that it should only be used when it adds significant value to the learning or teaching. For this reason, I’ve been keen on bringing elements not usually associated with the LTSIG along to our PCEs at IATEFL. In 2010 in Harrogate, we had Scott Thornbury give a presentation, and Luke Meddings sportingly facilitated a wonderful discussion on Dogme & IWBs at the recent conference in Brighton. Both of these went down extremely well. I was also impressed when Luke said he’d been making a point of going to a number of edtech presentations at conferences recently – I think stepping outside of our area and looking at what other teachers are doing is something we should all do. I also saw this when I was present at the ‘IWB & Dogme’ session that Tom Walton gave a couple of years ago, being present when Scott’s attitude to IWBs changed. Experiencing these transformational moments are important for all of us teachers to have, and are more likely to come when we step away from the familiar and engage with ideas outside of our experience, ready to learn from them. Looking forward to some of this at the Unplugged conference on Saturday – see you there! I’ve been following your thoughts too, and I really wish I could have been in Barcelona. Ah well, there will be other opportunities. I laughed at the pic of your desk, and it made me think of the miles of attic space taken up by boxes of booms in my house, maybe an unplugged approach to decluttering in general would be the next step. As far as the tech vs. dogme debste goes I just wanted to add that technology, for me and my learners, is often the means that enables us to communicate more on a different level. I think you could say that this is what is important, not the wiki where they write, post their ideas, links presentations etc. But the ideas, thoughts and words themselves, so that instead of the lesson growing out of the conversation in the classroom it is growing out of the lesson in the classroom and the space beyond the classroom, which is the wiki. Not sure if that makes sense as it’s getting late, so I’ll stop but thanks once again for your thout provoking discussions. Perfect sense, Sharon – even if it is past my bedtime! I see it the same way you do (and, I think, having listened to them a lot recently, people like Nicky Hockly and Graham Stanley (to name only two edtech-friendly teachers that I have had the good fortune of spending time with recently) Nicky Hockly at the Unplugged Conference shared a video made by some students during a course of lessons and in passing said something like: “of course, what you don’t see is the hours of language work that went into this video…” and I think this is part of the problem – polished finished tech products often disguise the raw effort and investment on language work that their production demands. This can lead casual observers not to notice their great positive impact on learner workrate etc. This is an observers’ problem, not a tech problem, but it may perhaps explain why some teachers underestimate the learning contribution that tech has to make in ELT.